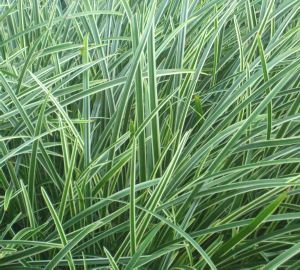 The dark green, stiff, linear, grass-like leaves of this dense, spreading, ornamental grass sedge are medium green variegated with clear white margins, grown for its foliage effect. Carex Ice Dance plants thrive in moist, shaded areas, typically growing to 30cm tall. Mass plantings will spread over time by rhizomes, to form an attractive ground cover. This is an excellent selection for shaded borders, shade gardens, woodland gardens, and low spots along ponds and streams. The moderate spreading habit of this sedge (unusually, as most sedges are clump-forming) facilitates covering woodland areas. The flowers in late spring are largely insignificant. This sedge is evergreen, maintaining a good appearance in both summer and winter. Uses: May be mass planted, or grouped in the woodland garden or border. May also be grown in low spots or along ponds or streams. Combine with other shade loving plants, such as Hostas, in a moist, shady border. Makes a very nice container plant also.